Cathy, who has shared the profits from his successful endeavors with many charities and causes, is one of this year’s Georgia Trustees. Still, creating his fast-food empire of more than 1,600 stores was no simple thing. Cathy had to experiment with seemingly endless combinations of seasoned coating mixtures, build his own cooking apparatus, develop a trade name and marketing plan and find employees he knew would share his fierce devotion to making his customers happy with the food and service they received. The seasoned coating was perfected by testing it out on customers at his Dwarf House restaurant in Hapeville until they no longer offered suggestions on improving the taste. The cooking appliance was modeled after his mother’s method of cooking fried chicken in a lidded frying pan. His new product was called the Chick-fil-A sandwich, and it was marketed to Atlanta-area restaurants as a licensed item to add to their menus, as well as the menu at his own restaurant. Cathy began his practice of recruiting employees and restaurant owners from his Sunday school classes. “Today we have 22 boys that were in my Sunday school class that are now with Chick-fil-A,” Cathy says proudly. “I knew them as kids and observed them, and I’ve observed them grow up. Some spent time in jail and others worked at Chick-fil-A when they were in school but have gone on to other career paths. We get the cream of the crop this way, and we have very little turnover.” Cathy says the company has many three-generation owner-operators. At the same time Cathy was experimenting with his sandwich, he began visiting food shows to show off his creation. By 1964, his Chick-fil-A sandwich was being served at 50 restaurants. In 1967, the first Chick-fil-A store opened in Atlanta’s Green-briar Mall, and an iconic American brand was born. It may have been prophetic that Cathy was born in Eatonton, once home to Joel Chandler Harris, perhaps Georgia’s greatest teller of tales, each with a moral buried in it, for Cathy loves a story, according to those who have worked with him. Cathy’s interest in helping others took a dramatic turn as his wealth grew. Since 1973, Chick-fil-A has provided scholarship contributions of more than $29 million in financial assistance to more than 28,000 Chick-fil-A team members attending 3,168 educational institutions across the nation. Since its inception in 1996, the S. Truett Cathy Award scholarships, which provide an additional $1,000 to the top 25 Leadership Scholarship receipents each year, have totaled $375,000. In addition to handing out awards, Cathy has won more than 100 prestigious awards on his own and has 13 honorary degrees and doctorates. He has authored seven books and been welcomed by Congress and President George W. Bush to discuss business ethics. 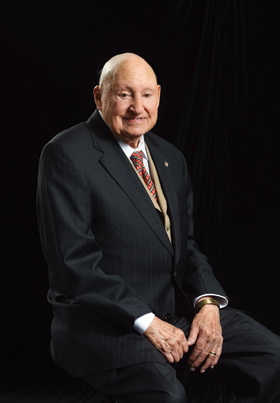 S. Truett Cathy was born in 1921 and had a Horatio Alger childhood – he would later receive the Horatio Alger Award – when he started his business career as the neighborhood kid selling Coca-Colas for pennies profit after the family moved to the Atlanta area. Following his WWII service, Cathy and his brother opened the Dwarf Grill in 1946 – later named the Dwarf House – near the site of the future Ford auto plant in Hapeville, destined to be a wellspring of customers for the restaurant. A menu from those days lists hamburgers for 15 cents each and a cup of coffee for a nickel. The Cathy brothers each worked 12-hour shifts to keep their restaurant open 24/7 and profits began to rise, but no one at the time could have predicted what lay ahead. Truett Cathy’s personal wealth is estimated to be between $900 million, according to his own Facebook page, and $1.5 billion, according to Forbes. His corporate and personal foundations have poured hundreds of millions of dollars into a variety of causes, primarily those supporting children and marriage and those that are faith-based. He is particularly fond of Berry College in Rome, where students work their way through school by performing tasks on the campus and its farm-related enterprises. “The worst thing you can do, especially for your children, is to give them things they didn’t have to work for,” he says. Cathy and his wife, Jeannette, have served as foster parents to more than 150 children, and their charitable causes include the Winshape Foundation, a nonprofit created in 1984 to provide college scholarships. The foundation has since expanded to include a network of children’s camps and foster homes for children in need, eight of them in Georgia and the rest in Tennessee, Alabama and Brazil. The foundation also assists in providing college and vocational training for young men and women and conducts conferences and marriage enrichment retreats at its upscale conference facility on the mountain campus of Berry College.